I’ve heard variations of this from many women over the years. Whether your dog pulls on leash, plays inappropriately with you or other dogs, jumps up on the kitchen countertops or is showing displays of growling, snapping or biting. All these problems are cited as related to your dog being dominant or your failure to be Alpha. I want EVERY woman to know, you absolutely DON’T have to be Alpha to get GOOD behavior from your dog! Not only is it unnecessary, it is in the better interest of you, your dog and your dog’s emotional wellbeing. Emotional wellbeing will carry the greatest effect on sociability. Today our dogs are living social lifestyles; therefore it is of the greatest importance we choose our parenting style carefully. There’s a common misrepresentation among those that refer to a Carrot or Stick approach to changing behavior. The carrot is referred to as used to reward behavior we desire. The stick exclusively used to punish undesirable behavior. This leads to many viewing the Carrot as permissive of poor behavior, inaccurate as it may be. The truth is both the Carrot and the Stick rely on both reinforcement and punishment. When we opt for the Carrot, we change behavior through giving or taking away things that your dog likes. Think snackies for rewarding awesome behavior and think time-outs for punishing the naughties. We give the Carrot for behavior we’d like to see more and take away the Carrot for behavior we’d like to see less. In the 21st Century the Carrot path for changing behavior is what we use in parenting children, managing people in the workplace and governing of our laws. The Stick path is as it sounds. It’s using things your dog finds scary, painful or intimidating to change behavior. The very things used on the Stick path are outlawed in our schools for children, our workplaces and our government enforcement of law. This is EXCELLENT NEWS for women! We tend naturally towards use of the carrot. It’s often for many of us against our very nature to use the Stick effectively. We’re not Alpha or Dominant in any of our relationships and we don’t need to change that to parent and raise a magnificent dog. The carrot approach for dogs involves yummy snacks, toys, fun & play. All the things that dogs love! When you reward your dog for doing the right thing, your dog will do the right thing more often. Wearing a Treat Pouch in the presence of your dog while teaching appropriate household behaviors and social manners will keep you from falling into the “show me the money” trap. Many believe your dog won’t do what is asked unless you have a treat. This isn’t the fault of the methodology; this is an easily overcome hiccup when you know how to effectively teach your dog. Tuna Fudge Dog Treats are my #1 go to in my puppy & dog training school! The dogs are crazy about it and it’s not messy on my fingers. Hey, as women this matters to us! You can get the recipe here, along with a cooking show for best practices in cooking, cutting up and storage between uses. My students rave about the convenience and effectiveness of Squeezy Cheese! We reserve the use of the powerful squeezy cheese for recalls, walking nicely on leash and Fear & Aggression issues. It’s doggy motivation on steroids! You can get the squeeze tubes at your local REI or get your squeeze tubes on Amazon. The Easy Cheese canisters can be picked up at your local grocer or ordered right along with your tubes, get easy cheese on Amazon too. Stand Proud Ladies & Embrace A Woman’s Way to Dog Parenting! Women, stand proud of who you are. We gravitate towards a more loving and kinder approach to parenting, leading and collaboration. More and more men are coming around to this approach too. We welcome those men with open arms. How you teach your dog life skills and manners is a choice, both approaches work. The Carrot Approach hands down is best and comes with no risk to our dog’s emotional well being which indeed effects sociability. For your dog you love dearly, choose The Carrot and stand proud ladies! Do you have a new puppy or adopted dog? Would you like to learn more to help your social dog enjoy a social lifestyle? Get your DogSense & enjoy your dog! It’s more than your usual dog training class. 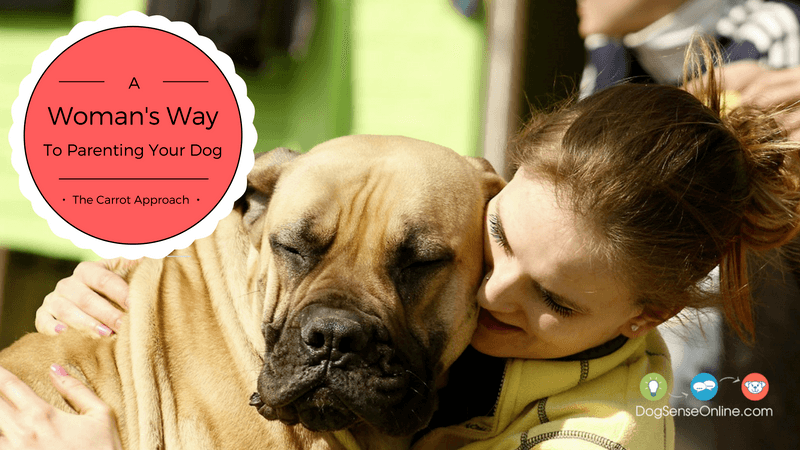 It’s a learn-at-home & at-your-pace dog behavior & online dog training eCourse. All Specifically designed with you and your social family dog in mind. Don’t miss our Go Anywhere Dog™ Puppy Training Classes in Minneapolis, MN for puppies under 18 weeks old or Off Leash Dog Training Classes in Minneapolis, MN for dogs over 18 weeks old. Our puppy classes and dog training classes are not only the best in town, their filled with loads of fun and learning for both pups and family!